In my previous blog post I explained how Level I and Level II Fieldwork experiences work in our program at USC, and shared about my previous Fieldwork placements. As promised, this blog is devoted to my current Level I Fieldwork experience! I am in the Pediatrics Immersion, which means that my Fieldwork is also in a pediatric OT setting. I’ve been placed in a local school district, so I get to see school-based pediatrics. I was really excited when I first got my placement, because I had observed pediatrics before, but not in a school-based setting, so this would be a new experience for me! I spend most of my time at an elementary school, but my Clinical Instructor (CI) and I also go over to a local high school to treat some students there as well. I just had my 3rd day at my Fieldwork site, and I have already gotten to observe and assist with so many different things! Because my CI has a pretty consistent schedule, I get to see the same kids each week. This allows me to see growth and change in the clients, helps them to become more comfortable with me, and gives me the opportunity to begin planning and leading treatments with them as I become more familiar with them, their goals, and their interests. The elementary school where I’m placed has a pretty unique setup, because my CI has an awesome OT clinic room all to himself – mats, obstacle course, swings, and all! With all of the materials and resources, there are so many possibilities for treatment and intervention, which is so exciting! Here you can see the OT clinic space at the elementary school. Lots of space for obstacle courses, movement, and fun! The OT clinic also has a great table-top setup to work on handwriting and other fine motor skills! 8:15 – Arrive, plan for the clients that day, prepare any materials needed. 9:00-9:30 – Pull a client out of class for an individual OT session. We used play-doh to work on hand strength, bilateral coordination (using both hands at the same time in a controlled manner), and pre-writing (by using the play-doh to spell out the client’s name). 9:30-10:00 – Pull another client out of class for an individual OT session. 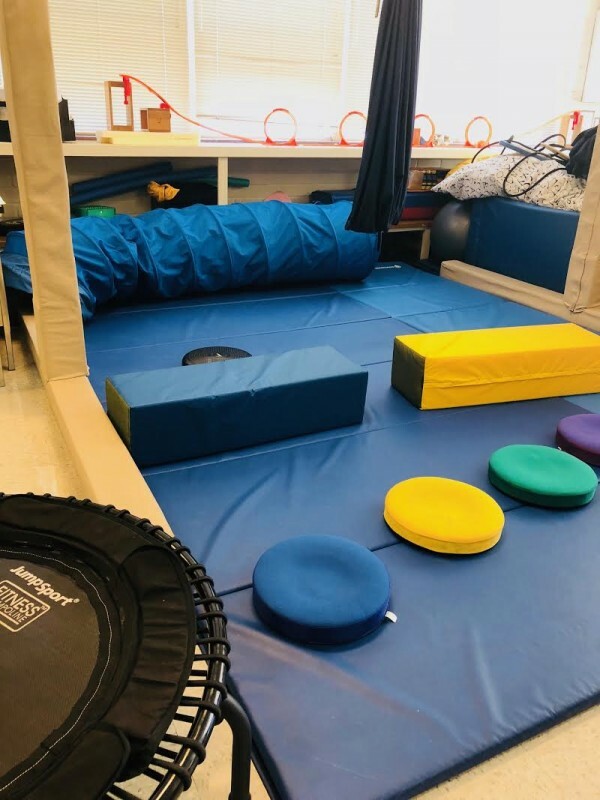 We used a three-step obstacle course in the clinic room to work on gross motor control (coordinating the large parts of your body, like legs, arms, and trunk to move) and task sequencing (progressing smoothly through a multi-step activity). 10:00-10:30 – Time for documentation and planning. 10:30-11:30 – We run an OT and Speech group with one of the Special Ed classrooms. We led the students through a song with choreographed dance moves (jumping, running in place, spinning) and then completed a craft activity based on the song that worked on fine motor skills (activities that require the use of the smaller body parts, such as the hands and fingers) like handwriting, cutting, coloring, tearing paper, and squeezing glue. 11:30-12:00 – Time for documentation and planning. 12:00-12:30 – Lunchtime (in the teacher’s lounge! It’s definitely not as mysterious as my elementary-school aged self thought it was  ). The mornings are pretty consistent, but the afternoons have a little bit more variability. Sometimes, we have meetings with parents and the rest of the team at school (Speech Therapists, Teachers, Psychologists, etc.) to address concerns or for an annual Individualized Education Program (IEP) meeting. At these meetings, it’s really cool to see the inter-disciplinary team working together to best support the individual child in the school environment. Other afternoons, we’ll go over to the nearby high school and work with some of the clients over there. I’ve enjoyed getting to see what school-based OT looks like for elementary-school aged children compared to high school students. I’ve only had 3 days of Fieldwork, but I’m seeing individual clinic sessions with elementary and high-school aged students, group sessions, IEP and parent meetings, and more! My CI is also very open to me jumping in, taking charge, and planning and implementing some sessions with the kids. As I continue to learn more in my pediatrics class and am exposed to more at Fieldwork, I expect I’ll get more and more comfortable taking on more responsibility at Fieldwork! My full week of fieldwork is coming up in a couple of weeks, so I’m looking forward to seeing even more clients! 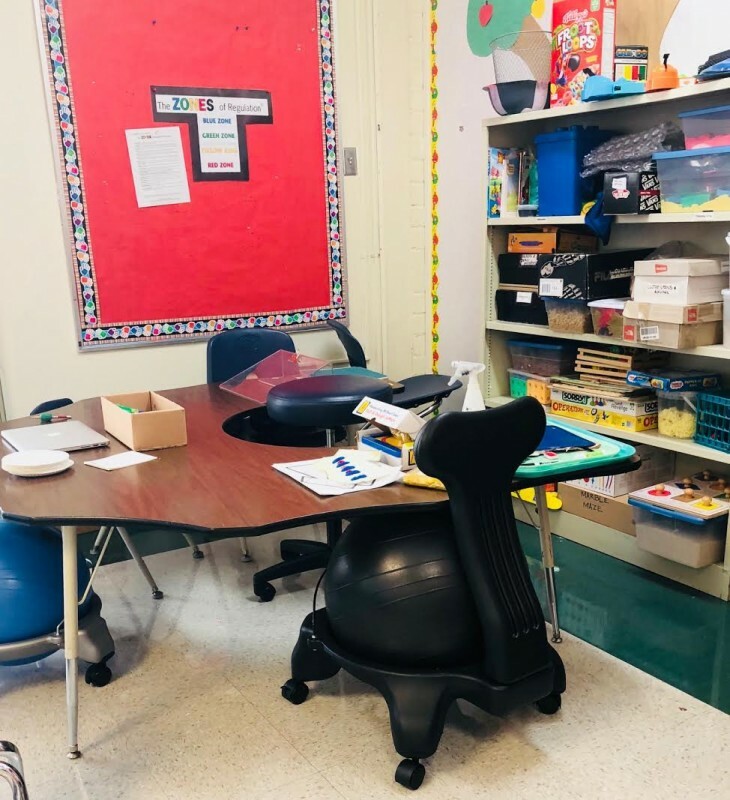 If you’ve observed OT in a school-based setting or have any questions about my experience, leave a comment below!